New Year, New Job. But First You Need Clear Career Goals. Can’t We All Just Get Along? It was a man with a giant frame and enormous personality who brought me to Boly:Welch’s door in 1998, almost 20 years ago today. And, it was my mother who delivered me to that man. With this newfound ability to squash limiting beliefs, I pumped my fist and made my power move from Chicago to Portland, believing anything, and I mean anything, was possible. I quickly found a job working with a startup (then archaically known as a small business), and when it failed fast (which was far less trendy in the 90s), I found myself instantly unemployed in a city of strangers. Because I had won the fastest typing competition in 7th grade and read all of Warren Buffett’s books by 11th grade (thanks, Dad), I was certain a temporary placement agency would scoop me up and assign me as successor to the president of Nike straight away. The team at Boly:Welch did embrace me, but it quickly became clear that the journey would be far more fascinating—and far more important—than the destination of a certain role or title. My first assignment was at the front desk of a pulp mill company where I observed the distinct roles of women and men in corporate culture. Only one female was seated on the expansive leadership team, and she was the granddaughter of the founder. During my next placement, I served as a stewardship coordinator with the OHSU Foundation for two years and developed a keen understanding of wealth distribution and philanthropy, as well as the power dynamics that stemmed from both. I photocopied and filed away six-figure personal checks—numbers on tiny pieces of paper that would directly impact the accessibility of education, medical research, and healthcare for millions of people in our communities. Lastly, I was assigned as a government grants archivist with Mercy Corps, where I charted the path of a local grassroots organization that became an internationally renowned humanitarian aid agency. I catalogued seven- and eight-figure checks from federal departments that would enable the installation of infrastructure, safety, and stability in the most rural corners of the world. Through these experiences, it became clear that wellness and well-being were inextricably linked to economic opportunity. However, one-size-fits-all solutions were clearly not as effective. Individuals required unique resources to achieve similarly meaningful outcomes. Yes, equality is an important value, but equity is the required action to operationalize this value. Now 20 years later, having lived, worked, and volunteered in organizations and communities around the world, across many different sectors, I am better equipped to unpack my own invisible backpack with a greater sense of purpose. I can recognize my privileges, gifts, stories, resources, skills, and tools. I am ready to have the tough conversations, to ask questions, to listen, and to maintain the courage to catalyze important change in our culture. Just a few months back, I lit a campfire and invited a diverse group of humans to circle up and unpack their own backpacks. 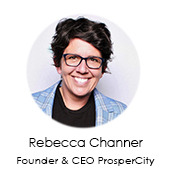 In that creative and vulnerable space, we founded ProsperCity—a social venture committed to advancing inclusion, equity, and diversity in the workplace. The cornerstone of our work focuses on salary transparency. We hold firm a commitment to dismantling the barriers to pay equity, especially those that negatively impact women and people of color. Change of this magnitude cannot be accomplished alone, and so it was my instinct to wander back to my professional roots and seek support. Founded by two brave women and led by a passionate group of people who operationalize their values around equity every day, Boly:Welch felt like home. Recruiting leaders is not as easy as inspiring followers, but I learned from the best. Hot coals and cool moss not required. Now together, we are laying the foundation for a better world. Are you ready to join the movement and ensure pay equity for all? Will you commit to being part of the rising tide that lifts all ships?